It never ceases to amaze me how improvements in one area of technology can affect changes and improvements in other area. In addition, it seems that once the technology increases and devices become easier to make, they also become cheaper and therefore, more affordable. One such device is the 3D printer. Last year we saw prices drop, as well as smaller, desktop models being made available. Being able to print in 3D has been a blessing to many fields and industries. This is the type of technology that is mostly associated with the automotive and aerospace industries. 3D printing can be used to create detailed and very accurate models that can be used as prototypes and tested. In addition, 3D printing can also be used to create structurally sound, yet much lighter versions of existing parts. While it does provide a lot of benefits in industrial fields, possibly, the area that can be of the most use and make a person’s quality of life better is in the healthcare industry. Imagine what it would be like if this technology can be used to create certain body parts. Does it sound a little like a Frankenstein movie? Believe it or not, 3D printing has already been used in the medical industry to create a jaw, a pelvis and several customized hip replacements from metal. England seems to have embraced the possibilities of 3D printing to create several items that have been successfully used. Earlier this year, a titanium pelvis was created by surgeons in Newcastle upon Tyne. This was used for a man who lost half his original hip to a rare bone cancer. This is not the only case, back in May, doctors in Southampton completed Britain's first hip replacement with the part being made using a 3D printer. What makes this exciting is that the replacement part was made from a computed tomography (CT) scan. A computer creates separate images of the body area, called slices. These images can be stored, viewed on a monitor, or printed on film. Three-dimensional models of the body area can be created by stacking the slices together. Essentially, this means that by lying down on a table and exact image can be created so that a perfect 3D duplicate of the original can be printed. Professor Richard Oreffo at the University of Southampton, who helped develop the hip replacement technique, said "The 3D printing of the implant in titanium, from CT scans of the patient and stem cell graft, is cutting edge and offers the possibility of improved outcomes for patients." Dentistry was possibly the first field that was able to take full advantage of 3D printing. Dentists can make exact 3D versions of a person’s jaw and teeth, thus letting them get a better understanding of how to perform a complicated procedure. In addition, implants, crowns, false teeth and more can be quickly and accurately printed out of durable plastic or medical ceramic. According to a new report published by independent market research firm, IDTechEx, located in Cambridge, we can expect to see the medical and dental market for 3D printing to increase by as much as 365 percent by 2025. This would represent a revenue stream of about $867 million. If you were to add the possibility of 3D bioprinting into the equation, analysts estimate the medical market could exceed a value of $6 billion within the next 10 years. 3D bioprinting is described as the process of generating spatially-controlled cell patterns using 3D printing technologies, where cell function and viability are preserved within the printed construct. Using 3D bioprinting for fabricating biological constructs typically involves dispensing cells onto a biocompatible scaffold using a successive layer-by-layer approach to generate tissue-like three-dimensional structures. The simple way to say it is that 3D bioprinting can be used to create pieces of skin, liver or kidney using live cells. Dr Jon Harrop, who is a director at IDTechEx, said "Bioprinting is a bit unsure as it doesn't exist commercially at the moment but all the medical professionals we interviewed thought it was highly likely to be commercial within 10 years." This is both very exciting and scary at the same time. Imaging the benefits of being able to create skin that can be used to help burn victims, or replace part of a diseased kidney. On the one hand wonderful, but also a little daunting on the other. Advancements are being made every day. 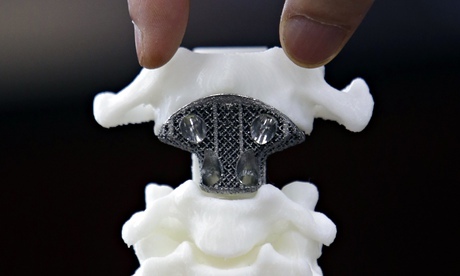 In Beijing, doctors are claiming that this year they successfully implanted a 3D printed artificial axis into the spine of a bone cancer patient. If this information is accurate, then it would be the first time that such a procedure was accomplished. Below is an image of the implant. As you can see, a model of the patient’s spine was also created, which give the doctors another advantage since they can test first on what is an exact copy of the patient’s spine, thus ensuring the proper placement of the replacement. As medical technology increases and doctors improve the processes of creating tissue that can be used to replace diseased or damage sections, the ability to harness, what is being referred to as one of the 21st century’s most exciting technological breakthroughs, will definitely be a huge boom to the medical industry and all of those that can benefit from it.